The annual rallies for immigration and labor rights, on the international workers' day, come just days after Baltimore erupted in riots and, more recently, peaceful protests over the death of Freddie Gray after his arrest. May Day Protesters March Against Police, "Tech Elite"
May Day activists who traditionally marched for labor and immigrant rights in U.S. cities on Friday broadened their message this year to lash out against police brutality and the "tech elite," where in Silicon Valley, many are being forced out of high-priced, gentrified neighborhoods. 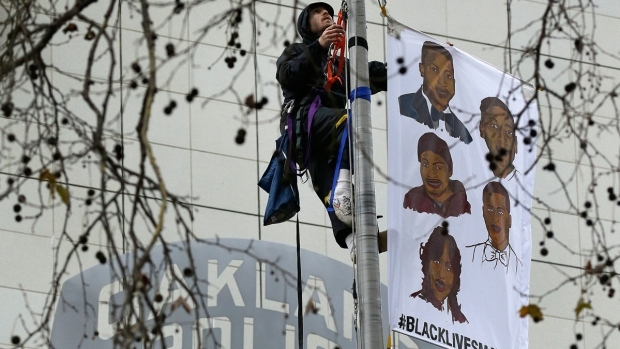 That includes Black Lives Matter protests throughout the Bay Area - with official rallies, pickets and shutdowns on Friday in Oakland, San Francisco and San Jose. And the gatherings took on new meaning after Baltimore State's Attorney Marily Mosby took the bold step of charging six police officers, one with murder, in what she called the illegal arrest of Freddie Gray and subsequent death on April 19. Protesters in the Bay Area took note of the announcement, carrying signs that read "We stand with Baltimore," outside Oakland City Hall. But other community activists in Oakland took aim, not only at police officers, but at rich tech workers who ride private buses to work and plunk down millions of dollars for homes in the pricey Bay Area. "I am sending a clear message that I don't want the tech businesses here," said a woman who only identified herself as Cleo, who moved to East Oakland after her rent jumped to $1,600. "I don't want their jobs here. I want them to leave because they are not giving back to the community." She was part of about 40 people who arrived about 7:30 a.m. to the MacArthur BART station in Oakland to "Block the Tech Commute." The protesters tried to prevent high-tech commuters from getting on private buses headed for Google and Facebook in Silicon Valley, about 45 miles away. A few people carried a sign that read "Your Friend Request Has Been Denied," in an obvious dig at Facebook and its high-paid employees. Sam-Omar Hall, 30, a freelance journalist who live-tweeted the protest, said that about 8:30 a.m. two protesters were briefly able to block one bus before a police officer went up to them and said: "I'm only gonna ask you once," prompting them to move. For the most part, the tech giants knew about the protests and were able to divert their buses. Loop Transportation empoyees picked up passengers at the West Oakland BART instead. From there, an activist who goes by "Not Frantz Fanon" tweeted that hundreds had gathered for a #LaborAgainstPoliceTerror rally at the Port of Oakland, where people marched to City Hall. Some carried signs that read "Justice 4 Pedie," in reference to Richard "Pedie" Perez, 24, who was killed on Sept. 14, 2014 by Richmond police. The Contra Costa County District Attorney announced that Officer Wallace Jensen acted in self-defense when he was "attacked" by Perez outside a liquor store. Perez's family filed a federal lawsuit against the department, claiming Perez's last words were "don't shoot." The NBC Bay Area chopper flew overhead showing people arriving in droves. Port worker Trent Wilis was one of those protesting. "My life matters as a black man," he said, who added that the ills of society boil down to "poverty and discrimination." The rallies, at least in the day, did not get out of control. 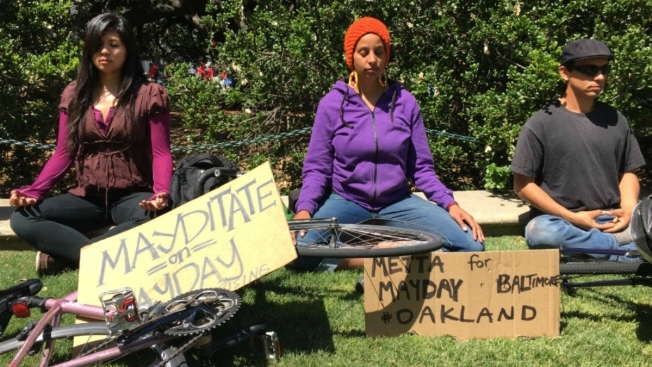 In fact, in front of Oakland City Hall, several women were "mayditating," or meditating, to show their frustrations without yelling or shouting. There were "Workers for Dignity" and "Migrants Against State Violence" protests in San Francisco and an "International Workers Day" rally and march in San Jose. Similar protests were held around the country, from Boston to Los Angels. For more than a century, International Workers' Day has been celebrated on May 1 to mark the 1886 Haymarket Riot in Chicago, when a bomb turned a worker rally into a deadly event. Some rallies are still mostly focused on labor and immigration issues, such as an event in Portland, Oregon, where advocates will support hiking the minimum wage and President Barack Obama's program to protect millions of immigrants in the country illegally from deportation. NBC Bay Area's Jodi Hernandez and the Associated Press contributed to this story.